Use this 10-item pretest to test your knowledge in Reading. Record your pretest score and then study the tutorials that are provided on this site. When you feel that you are ready to take your TSI Assessment, you should schedule your test at the Testing Center. Read the passage below and then choose the best answer to each question. Answer the questions on the basis of what is stated or implied in the passage. In this passage taken from a short story, the narrator describes the cabin where her father worked. I wasn't sure what this work involved, but it must have been exciting because the Lab itself was exciting. Anywhere we didn't go often was exciting. We would get there in a heavy wooden rowboat, built in the five-house village half a mile away—our mother would row, she was quite good at it—or by following a twisty, winding footpath, over fallen trees and stumps and around boulders and across wet patches where a few slippery planks were laid across the sphagnum moss, breathing in the mildew smell of damp wood and slowly decaying leaves. It was too far for us to walk, our legs were too short, so mostly we went in the rowboat. The Lab was made of logs; it seemed enormous, though in the two photographs of it that survive it looks like a shack. It did however have a screened porch, with log railings. Inside it there were things we weren't allowed to touch—bottles containing a dangerous liquid in which white grubs floated, their six tiny front legs clasped together like praying fingers, and corks that smelled like poison and were poison, and trays with dried insects pinned to them with long, thin pins, each with a tiny, alluring black knob for a head. All of this was so forbidden it made us dizzy. At the Lab we could hide in the ice house, a dim and mysterious place that was always bigger on the inside than it was on the outside, and where there was a hush, and a lot of sawdust to keep the blocks of ice cool. Sometimes there would be a tin of evaporated milk with holes punched in the top and wax paper stuck over them; sometimes there would be a carefully hoarded stub of butter or an end of bacon; sometimes there would be a fish or two, pickerel or lake trout, already filleted, laid out on a chipped enamel pie plate. Margaret Atwood, excerpt from "The Boys at the Lab" from Moral Disorder: Stories. Copyright © 2006 by O. W. Toad, Ltd. Used by permission of Nan A. Talese/Doubleday, a division of Random House, Inc. Any third party use of this material, outside of this publication, is prohibited. Interested parties must apply directly to Random House, Inc. for permission. This question requires you to explore the author's use of language to identify ideas. To answer this question you will need to review the details in the story one by one to determine the author's suggestion. Choice (C) is correct. The narrator uses the past tense throughout the passage, signaling to the reader that the events described occurred in the past. And the passage contains numerous hints that the narrator is describing her childhood self: "our mother would row" and "our legs were too short," for example. It is reasonable to assume that the narrator is an adult recalling a location (and events) from childhood. Choices (A) and (B) are incorrect because the incidents described are clearly not recent, nor do the events recalled happen to a middle-aged person. And although the place has elements of scariness about it, the person describing it is clearly not a child; therefore, choice (D) is incorrect. To answer this question, reread the text and take note of the similarities and differences between the descriptions. Choice (C) is correct. When describing the Lab, the narrator states that "it seemed enormous, though in the two photographs of it that survive it looks like a shack." When describing the ice house, she states that it "was always bigger on the inside than it was on the outside." Both these descriptions emphasize misconceptions about the size of a place. The first misconception occurs because of a child's natural perception that a place is larger than it is in reality, and is corrected by an adult viewing of photographs; the second plays on a child's mistaken perception of the size of a place based on its exterior. Choices (A) and (D) are incorrect because there are no cheerful and light-filled surroundings in the passage, nor is there a description of the narrator's home. And although the narrator does speak of hiding and concealing herself in the ice house, she does not speak of doing so in the Lab itself; therefore, choice (B) is incorrect. To answer this question refer back to the passage and identify the author's exact words. Reread and figure out the message the author is sending with the words used. Which of the words below most closely matches the author's idea? Choice (D) is correct. In the first part of the passage, the narrator refers to "this work," saying that "it must have been exciting because the Lab itself was exciting." While she isn't "sure what this work involved," she describes the Lab very fully: the mysterious journey to get to it, its exterior, then its contents ("bottles containing a dangerous liquid in which white grubs floated . . . trays with dried insects") and other aspects of her father's work. The narrator never directly states what "this work" is, but these and other elements of the passage imply that it involves scientific research with such insects as the grubs. Choices (A), (B), and (C) are incorrect because there is no indication in the passage that the narrator's father is involved in writing, food science, or photography. To answer this question, reread the text and analyze the characters by name within the story. Choice (A) is correct. In lines 3-4, when referring to the journey to the Lab, the narrator states, "our mother would row." At the end of the passage—after she has described repeated adventures at the Lab while accompanied by at least one other person—she recalls hearing "our mother's voice calling us, because it was time to get back into the rowboat and row home." It is clear that the narrator's companion shared a mother and a home with the narrator—in other words, the other person is the narrator's sibling. Choices (B) and (D) are incorrect because the narrator's mother is clearly differentiated from the companion in the passage and the reader does not participate in the events described in the passage. Although the narrator is describing the place where her father worked, there is no indication that her father was the other person accompanying her; indeed, it is unlikely that the narrator's father's legs would be "too short" for the walk, and he might not hide with a small child inside an ice house. Therefore, choice (C) is incorrect. In 2010, talk show host Oprah Winfrey and novelist Jonathan Franzen kissed and made up after a nine-year feud. In 2001, Franzen was disinvited from appearing on Winfrey's TV show to pitch his novel The Corrections after he made it clear that he was unhappy about the book's being chosen for the Oprah Book Club. Describing his work as "in the high-art literary tradition," Franzen said he didn't want to be associated with the Club, which he accused of occasionally choosing "schmaltzy, one-dimensional" novels. But Winfrey is apparently able to forgive and forget: she chose Franzen's next novel, Freedom, for her book club and said of it, "Now you haven't heard me say this word often, but this book is a masterpiece." This question requires you to explore the author's use of language to identify ideas. To answer this question you will need to review the details in the story one by one to extract the author's idea and reasoning. Choice (A) is correct. The author of the passage states that Franzen refers to his own work as belonging to a "high-art literary tradition" and to Oprah's book club choices as being schmaltzy," or overly sentimental, and "one-dimensional." These details suggest that Franzen felt that his own book is of higher quality than other books chosen for the book club. In other words, Franzen's criticism of the Oprah Book Club was motivated by his pride, or his sense of self-importance. Choices (B) and (C) are incorrect because there is no indication in the passage that Franzen felt any anger or was trying to be insensitive. Choice (D) is incorrect because there is no indication that Franzen's comments about Oprah's choices were ignorant or uninformed. If you are committed to healthy, green living and want to reduce your environmental footprint, you might consider expanding your daily diet to include bugs. Supporters of the edible insect initiative rightfully argue that farming insects has a much lower environmental impact than does raising livestock since bugs are easier to harvest and require a fraction of the water and land space that cattle need. Indeed, the high-protein, low-fat health benefits of bug-eating have long been known. For hundreds of years, crickets, silkworms and even tarantulas have been served roasted, stewed and fried at the dinner tables of many cultures. Which words best describe the author's attitude toward the "edible insect initiative"? This question requires you to explore the author's use of language to identify ideas. To answer this question you will need to review the language the author uses to determine how the author feels towards the topic being discussed in the passage. Choice (B) is correct. The author of the passage is interested in and supportive of the edible insect initiative. He or she addresses the reader directly, urging, "you might consider expanding your daily diet to include bugs." The author also shows support for the edible insect movement by stating that advocates of the movement "rightfully" argue that "farming insects has a much lower environmental impact than does raising livestock." Choice (A) is incorrect because although the author expresses support for the edible insect initiative, he or she does not speak with awe and amazement, or great wonder. Choices (C) and (D) are incorrect because the author is positive about the movement, showing interest and support rather than fear or disgust. When we think of volcanoes, eruptions, lava, and smoke-filled air come to mind—all occurring on land. Most people are surprised to learn about the prevalence of underwater volcanoes on our planet. Because the lava and smoke spilling out of an active, underwater volcano is contained by the ocean, people generally do not take note of these eruptions. However, the largest underwater volcanoes are capable of creating huge tidal waves, threatening coastal communities. To answer this question, identify the topic of the passage. Then, consider what the author wants to emphasize about the topic. Choice (D) is correct. The main idea of the passage is that underwater volcanoes receive little attention but can be dangerous. The author explains that while "people generally do not take note" of underwater eruptions because "the lava and smoke . . . is contained by the ocean," such eruptions are dangerous because they are "capable of creating huge tidal waves, threatening coastal communities." Choice (A) is incorrect because the passage highlights differences, not similarities, between traditional and underwater volcanoes. Choice (B) is incorrect because although the passage notes that the lava and smoke from underwater volcanoes is contained by the sea, that fact is not the main idea; it supports the larger point about what people notice. Choice (C) is incorrect because the passage does not indicate that most tidal waves are caused by underwater eruptions. The main authors of The Declaration of Independence and the Constitution are usually thought of as America's "Founding Fathers." Other less known personages also deserve the title, and Noah Webster was one of these. Through his writings, which include the still influential dictionary that bears his name, Webster sought to legitimize an "American English" that was independent of British spelling and pronunciation. For instance, Webster removed the "u" from "colour," creating the distinct American version of the word. What is the main purpose of this passage? C. To define and explain "American English"
To answer this question, consider why the author wrote this text. Is the author trying to inform you about something, entertain you with a story that evokes emotion, or is the author attempting to incite action or persuade you to do something? Choice (B) is correct. The author discusses Noah Webster and the idea that he deserves the title of Founding Father. The author clearly considers Webster important, citing his "still-influential dictionary" and his attempt to "legitimize an 'American English.'" Choice (A) is incorrect because although the author mentions that the Founding Fathers authored certain documents, he or she offers no specific praise of the Founding Fathers. Choices (C) and (D) are incorrect; although the author mentions Webster's attempt "to legitimize an 'American English'" and to create an American English dictionary, neither of these points is the main focus of the passage. There is almost no reliable data about the level of technological literacy among children in the United States. Our students perform relatively poorly on international tests in science and math, however, and many other Western countries teach more about technology than we do. It seems that American students are not as technologically literate as their international counterparts. This could put them at a disadvantage when it comes to their careers, because technology is everywhere, from medical facilities to farms. Obviously, it is imperative that teachers and parents make the use of technology, including computers, a more central part of children's lives. To answer this question you will need to identify what the author has stated in the text and then think beyond the printed words. Incorporate what you know about the world to find the most logical answer based upon the text and what makes sense to you. Choice (B) is correct. The author of Passage 1 finds it very troubling that so many children spend their time on computers and other electronic devices instead of playing outside. The author of Passage 2, on the other hand, thinks technology should be an even bigger part of children's lives than it already is. It is likely that the author of Passage 1 would criticize the author of Passage 2 for failing to think about the drawbacks of this increased time spent on technology—such as a decreased amount of time to spend "learn[ing] and develop[ing] through outdoor activities." Choice (A) is incorrect because the author of Passage 2 states that there is very little "reliable data," and choice (C) is incorrect because he or she does not discuss and dismiss development during outdoor activities. Choice (D) is incorrect because the author of Passage 1 makes no mention of careers, and there is no indication that the author of Passage 2 is exaggerating when speaking of careers. Choice (D) is correct. The author of Passage 2 believes that American students should be more technologically literate and suggests that "the use of technology, including computers," should be "a more central part of children's lives." Therefore, he or she almost certainly would say that instead of limiting computer use, parents should encourage children to spend more time using computers. Choices (A), (B), and (C) are incorrect because the author of Passage 2 does not discuss outdoor activities, adults' computer knowledge, or children's recreational preferences. Use the scale below to see where you might be placed when you take the actual TSI Assessment for Reading. This is not your actual TSI Assessment placement score. 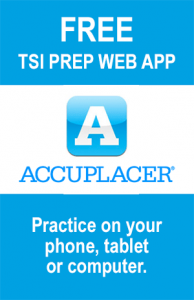 To get that, you must complete the TSI Assessment itself at your nearest ACC testing center. If you feel you need more preparation prior to taking the actual TSI Assessment, you should go to the Reading Review section of the website for additional information and practice. If not, return to the TSI Practice Tests section to complete your other required practice tests (if necessary) and complete your TSI Pre-Assessment Activity (PAA) Verification Form. You will need this completed form or email confirmation to sign up for the TSI Assessment.